(1863/1929) - Huge central square built as a bridge between old and new town and obviously named after the country of which Barcelona is the Capital. There are actually 4 stations underground: L1, L3, the terminus station for the FGC urban and suburban lines (5 platforms) and a RENFE Suburban Rail station parallel to L1. (1882/1929) - Street named after Southern French region 'Provence'. Underground corridor to metro station 'Diagonal'. (1954) - Square named after a 19th century architect, Francesc Daniel Molina i Casamajor. 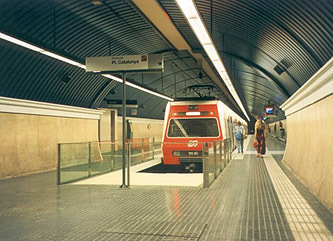 Station located just next to Sant Gervasi station on L6. (1954) - Street named after a town in Italy, Padova. (1954) - actually means low hill, and there is one with that name. (1954) - Tibidabo is the name of the mountain you can go up from here. First take the 'Blue Tramway' (Tramvia Blau) and then the funicular and you'll get the best view over Barcelona. The name actually is Latin for 'I shall give you' ... this piece of land - legend has it that a bishop of Barcelona said so to a monk who wanted to build his hermitage up on the mountain. Sharing tracks with line L6 and suburban services between Pl. Catalunya and Gràcia. 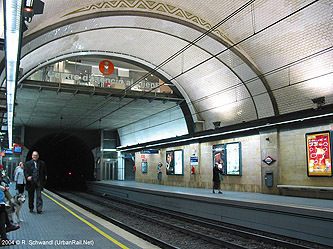 The original line was put underground in 1929 up to Muntaner on line L6, the completely underground branch to Av. Tibidabo being built in 1954.